Interlock 3 has been written for two performers controlling a single sawtooth wave generator. The two performers simultaneously control the frequency of the same monophonic sound throughout the entire piece. Both performers play on a fixed range of two octaves. Their impact on the sound, however, is different: While the two octaves of the first performer change the resulting frequency in a range of slightly more than one octave, the second performer controls a range of approximately five octaves, resulting in rather odd scales. 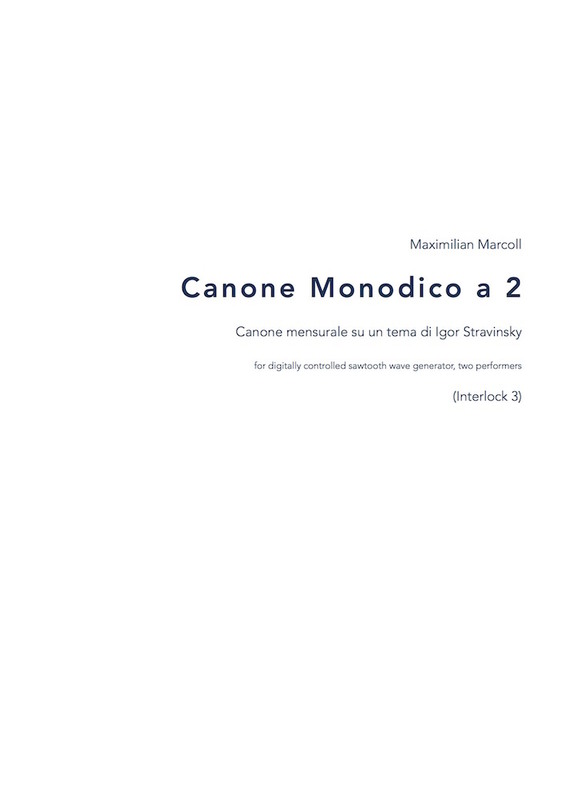 The diminution and augmentation of the range played on by the performers corresponds to the organisation of the musical text that is being performed: Interlock 3 is a proportional canon. While the first performer plays the text twice, the second performer plays it only once, in half speed. The text itself is composed of nothing else but augmentations and diminutions (in both time and pitch) along with their inversions and retrogrades, all derived from the opening theme of Stravinsky’s “Le sacre du printemps”. The overall organisation of those variations is laid out in the form of one long downwards glissando, which corresponds to the waveform used to play the piece, the sawtooth wave. Interlock 3 is also a “table canon”. Just like the sawtooth waveform, (comprised of all harmonics with their relative amplitudes being their respective inverted [sic!] index), the entire piece is symmetrical: it is its own inverted retrograde.